While Super Smash Brothers for the Wii U and 3DS has been out for just over a year and the recent announcement of Cloud joining the roster garnering a massive amount of hype, many fans of the fighting game probably haven’t heard of a new ‘Smasher’ that hit Steam Early Access earlier this year. 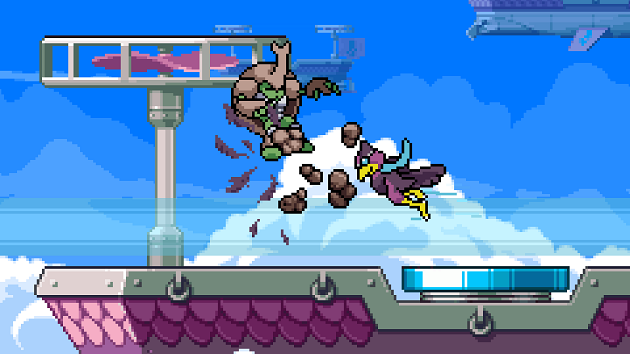 Rivals of Aether, a ‘Smash-esque’ fighting game, was released on September 22nd, 2015 and has become a hit since then. Combining the fast paced speed of Super Smash Brothers Melee, a parry system that emphasizes timing like Street Fighter 3rd Strike, and different play-styles for each and every character, 'Rivals' holds so much polish and charm that fighting game fans across the board can enjoy. More than that, it sets itself apart from Super Smash Brothers in enough ways to create its own identity, while catering to players of the series. As a huge fan of the Smash Brothers series, I found myself loving 'Rivals' the second I picked it up for its speed and technical capabilities. So imagine my excitement when the opportunity came to interview the creator, Dan Fornace, about the game. Andrew Perry: How has the reception for Rivals of Aether been since launch? Dan Fornace: Reception has been incredible. Bigger than we expected for sure. It was a surreal experience seeing so many people try out the game on our first week of Early Access. It was particularly cool to see some of the Smash Bros pros that I have watched for years give the game a shot and enjoy themselves. Andrew Perry: How has the process been porting 'Rivals' to the Xbox One? Dan Fornace: The port to Xbox One has been moving behind the scenes. Due to the amount of work it takes to have a game on Early Access, we wanted to reach out and find someone to help specifically with the Xbox One version. We are working on finalizing our agreement and then hope to be able to get on the Xbox Game Preview Program as soon as possible. Andrew Perry: What caused you to make some of the decisions that separate 'Rivals' from other Smash-esque fighters? Mainly, the replacement of shielding with a parry system and no ledges but a wall jump for each character? Dan Fornace: So the majority of the engine design choices are made for two reasons. The first is that 'Rivals' has a focus on offensive combat, that means defensive options that players see in the smash series have been reduced. The second is for scope reasons. Grabs were one of the first tools eliminated as I knew the work required to make multi-directional throws look good. You can't just animated them for each character if you want to do cooler throws, you have to give opponents custom reactions. When working with sprites, the workload becomes exponential based on the number of characters in the game. Once we eliminated grabs, we had to remove shields. We essentially removed rock-paper-scissors from a fighting game. Now we were left with just attacking. The parry initially started out similar to a smash spot dodge. But then I added a powershield version of the spot dodge that would have better effects than just dodging. Because of how useful this beefed up spot-dodge was, I ended up extending its active frames to the entire length and created a Parry. The Parry has 2 startup frames, 8 active frames and 20 recovery frames across most the characters. When your opponent hits you during the 8 active frames of the Parry, you gain invincibility and then your opponent suffers additional lag once their attack completes. That means if you parry something slow and strong such as a Kragg Forward Strong, then you have the time it takes for the the attack to end AND the additional lag to punish Kragg. There are two ways to counter parries. The first is by baiting them out. Because nearly all aerials autocancel, you can actually bait out a parry by attacking close but weaving away instead of hitting. This is similar to safely shield poking with aerials in Smash Bros. The second way to work around parries is by using jabs up close. As long as you don't finish the jab combo, you will not have extra lag if your jab is parried. Jabs are low-risk, low-reward. Ledge grabs were removed because of my time playing Super Smash Brothers Brawl competitively. I had been in matches that went to time (not that uncommon as I played Sonic) and I had seen just how destructive ledges became in the Brawl competitive scene. I wanted to make sure there was no stalling off stage and that the corner was not the safest part of the battlefield. Each character can wall-jump even out of prat fall, but you only get one jump unless you are hit or touch solid ground. This is to prevent stalling off stage while giving a character like Zetterburn some tools to mix up his recovery. Andrew Perry: Every character in 'Rivals' plays differently, having a unique quirk or mechanic that no other character can emulate, so you get a distinct feeling when playing each. How did you think of ways to make each one different? Dan Fornace: Part of the design behind the movesets was to make something unique to give each character its own identity. For inspiration, we don't simply look at Smash Bros or Fighting Games. Wrastor's current for example is inspired by Galio's Righteous Gust from League of Legends while Kragg's Pillar was inspired by the test scene in Full Metal Alchemist. When first designing a character we begin with creating a few mechanics that tie into each other. We have a bit of an advantage in this regard because many of the character designs are created after the moveset designs. We know what type of moveset we want to create and then can design a character visual to match. This also allows us to tie attacks and specials together in unique ways because we think of each moveset holistically rather than as separate attacks. Andrew Perry: With Absa being released, who I cannot wait to play, I have to ask—any information on the next locked character? We already can gather it’s a water elemental, but any other hints you can tell us? Dan Fornace: It is the last character in our initial roster of 8. And yes it will be our second water character. The roster could probably use another heavy so Kragg has a friend, don't you think? Andrew Perry: I noticed some Melee pros, such as Mang0, have played Rivals and seemed to enjoy it. Do you think 'Rivals' has the potential to become a game played at EVO annually? Andrew Perry: How long do you plan on supporting 'Rivals'? Will we see more characters released in the future if the game does well? Dan Fornace: We plan to support 'Rivals' for around one year after our full launch. I would love to expand the roster and do a couple of balance passes after we fully launch. After we add a few more characters, I would aim to take our learnings and start on a bigger scoped game in the world of Aether. We have a solid base that we could build off and expand on. I see an opportunity for Platform Fighters to thrive in a similar vein as MOBAs did about 5 years ago. We want to make sure we are at the forefront of that movement.